Freiburg im Breisgau (German pronunciation: ; Alemannic: Friburg im Brisgau [ˈfʁiːb̥əg̊]; French: Fribourg-en-Brisgau) is a city in Baden-Württemberg, Germany with a population of about 220,000. In the south-west of the country, it straddles the Dreisam river, at the foot of the Schlossberg. Historically, the city has acted as the hub of the Breisgau region on the western edge of the Black Forest in the Upper Rhine Plain. A famous old German university town, and archiepiscopal seat, Freiburg was incorporated in the early twelfth century and developed into a major commercial, intellectual, and ecclesiastical center of the upper Rhine region. The city is known for its medieval minster and Renaissance university, as well as for its high standard of living and advanced environmental practices. The city is situated in the heart of the major Baden wine-growing region and serves as the primary tourist entry point to the scenic beauty of the Black Forest. According to meteorological statistics, the city is the sunniest and warmest in Germany and held the all-time German temperature record of 40.2 °C (104.4 °F) from 2003 to 2015. Freiburg was founded by Konrad and Duke Bertold III of Zähringen in 1120 as a free market town; hence its name, which translates to "free (or independent) town". Frei means "free", and Burg, like the modern English word "borough", was used in those days for an incorporated city or town, usually one with some degree of autonomy. The German word Burg also means "a fortified town", as in Hamburg. Thus, it is likely that the name of this place means a "fortified town of free citizens". This town was strategically located at a junction of trade routes between the Mediterranean Sea and the North Sea regions, and the Rhine and Danube rivers. In 1200, Freiburg's population numbered approximately 6,000 people. At about that time, under the rule of Bertold V, the last duke of Zähringen, the city began construction of its Freiburg Münster cathedral on the site of an older parish church. Begun in the Romanesque style, it was continued and completed 1513 for the most part as a Gothic edifice. In 1218, when Bertold V died, the counts of Urach assumed the title of Freiburg's count. The city council did not trust the new nobles and wrote down its established rights in a document. At the end of the thirteenth century there was a feud between the citizens of Freiburg and their lord, Count Egino II of Freiburg. Egino raised taxes and sought to limit the citizens' freedom, after which the Freiburgers used catapults to destroy the count's castle atop the Schloßberg, a hill that overlooks the city center. The furious count called on his brother-in-law the Bishop of Strasbourg, Konradius von Lichtenberg, for help. The bishop responded by marching with his army to Freiburg. Panoramic view of Freiburg, seen from Schlossberg, Freiburg Münster can be seen in the center. 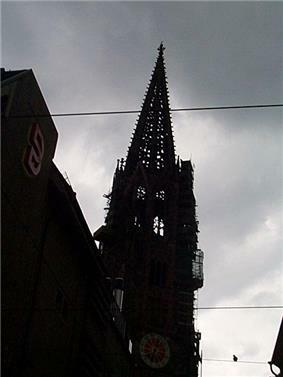 According to an old Freiburg legend, a butcher named Hauri stabbed the Bishop of Strasbourg to death on 29 July 1299. It was a Pyrrhic victory, since henceforth the citizens of Freiburg had to pay an annual expiation of 300 marks in silver to the count of Freiburg until 1368. In 1366 the counts of Freiburg made another failed attempt to occupy the city during a night raid. Eventually the citizens were fed up with their lords, and in 1368 Freiburg purchased its independence from them. The city turned itself over to the protection of the Habsburgs, who allowed the city to retain a large measure of freedom. Most of the nobles of the city died in the battle of Sempach (1386). The patrician family Schnewlin took control of the city until the guildsmen revolted. The guilds became more powerful than the patricians by 1389. 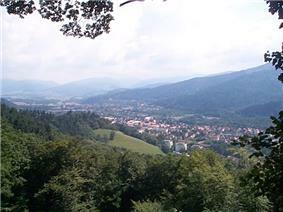 The silver mines in Mount Schauinsland provided an important source of capital for Freiburg. This silver made Freiburg one of the richest cities in Europe, and in 1327 Freiburg minted its own coin, the Rappenpfennig. In 1377 the cities of Freiburg, Basel, Colmar, and Breisach entered into an alliance known as the Genossenschaft des Rappenpfennigs (Rappenpfennig Collective). This alliance facilitated commerce among the cities and lasted until the end of the sixteenth century. There were 8,000-9,000 people living in Freiburg between the thirteenth and fourteenth centuries, and 30 churches and monasteries. At the end of the fourteenth century the veins of silver were dwindling, and by 1460 only approximately 6,000 people still lived within Freiburg's city walls. A university city, Freiburg evolved from its focus on mining to become a cultural centre for the arts and sciences. It was also a commercial center. 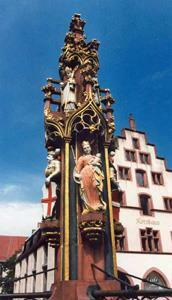 The end of the Middle Ages and the dawn of the Renaissance was a time of both advances and tragedy for Freiburg. In 1457, Albrecht VI, Regent of Further Austria, established Albert-Ludwigs-Universität, one of Germany's oldest universities. In 1498, Emperor Maximilian I held a Reichstag in Freiburg. In 1520, the city ratified a set of legal reforms, widely considered the most progressive of the time. The aim was to find a balance between city traditions and old Roman Law. The reforms were well received, especially the sections dealing with civil process law, punishment, and the city's constitution. In 1520, Freiburg decided not to take part in the Reformation and became an important centre for Catholicism on the Upper Rhine. In 1536, a strong and persistent belief in witchcraft led to the city's first witch-hunt. The need to find a scapegoat for calamities such as the Black Plague, which claimed 2,000 area residents (25% of the city population) in 1564, led to an escalation in witch-hunting that reached its peak in 1599. A plaque on the old city wall marks the spot where burnings were carried out. The seventeenth, eighteenth, and nineteenth centuries were turbulent times for Freiburg. At the beginning of the Thirty Years' War there were 10,000-14,000 citizens in Freiburg; by its end only 2,000 remained. During this war and other conflicts, at various times the city belonged to the Austrians, the French, the Swedish, the Spanish, and various members of the German Confederacy. Between 1648 and 1805, it was the administrative headquarters of Further Austria, the Habsburg territories in the southwest of Germany, when the city was not under French occupation. In 1805, the city, together with the Breisgau and Ortenau areas, became part of Baden. On 22 October 1940, the Nazi Gauleiter of Baden ordered the deportation of all of Baden's Jews, and 350 Jewish citizens of Freiburg were deported to the southern French internment camp of Camp Gurs in the Basses-Pyrénées. They remained there under poor conditions until 18 July 1942, when the majority of the survivors were sent to their deaths at Auschwitz. The cemetery for German Jews who died at Camp Gurs is maintained by the town of Freiburg and other cities of Baden. A memorial stands outside the modern synagogue in the town centre. The pavements of Freiburg carry memorials to individual victims in the form of brass plates outside their former residences, including that of Edith Stein, a German Jewish philosopher who converted to Catholicism, became a nun, and was canonized as St. Teresa Benedicta of the Cross in 1998. 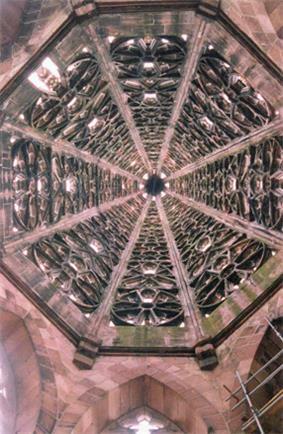 Freiburg was heavily bombed during World War II. First, in May 1940, aircraft of the Luftwaffe mistakenly dropped approximately 60 bombs on Freiburg near the train station, killing 57 people. Later on, a raid by more than 300 bombers of the RAF Bomber Command on 27 November 1944 (Operation Tigerfish) destroyed a large portion of the city centre, with the notable exception of the Münster, which was only lightly damaged. After the war, the city was rebuilt on its medieval plan. 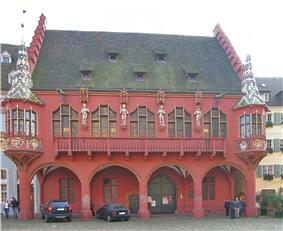 It was occupied by the French Army in 21 April 1945, and Freiburg was soon allotted to the French Zone of Occupation. In December 1945 Freiburg became the seat of government for the German state Badenia, which was merged into Baden-Württemberg in 1952. The French Army maintained a presence in Freiburg until 1991, when the last French Army division left the city, and left Germany. Because of its scenic beauty, relatively warm and sunny climate, and easy access to the Black Forest, Freiburg is a hub for regional tourism. The longest cable car run in Germany, which is 3.6 kilometres (2.2 mi) long, runs from Günterstal up to a nearby mountain called Schauinsland. 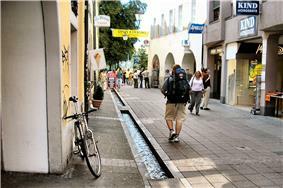 The city has an unusual system of gutters (called Freiburg Bächle) that run throughout its centre. These Bächle, once used to provide water to fight fires and feed livestock, are constantly flowing with water diverted from the Dreisam. They were never intended to be used for sewage, and even in the Middle Ages such use could lead to harsh penalties. During the summer, the running water provides natural cooling of the air, and offers a pleasant gurgling sound. It is said that if one accidentally falls or steps into a Bächle, they will marry a Freiburger, or 'Bobbele'. The Augustinerplatz is one of the central squares in the old city. Formerly the location of an Augustinian monastery that became the Augustiner Museum in 1921, it is now a popular social space for Freiburg's younger residents. It has a number of restaurants and bars, including the local brewery 'Feierling', which has a Biergarten. On warm summer nights, hundreds of students gather here. At the centre of the old city is the Münsterplatz or Cathedral Square, Freiburg's largest square. A farmers market is held here every day except Sundays. This is the site of Freiburg's Münster, a gothic minster cathedral constructed of red sandstone, built between 1200 and 1530 and noted for its towering spire. The Historical Merchants' Hall (Historisches Kaufhaus), is a Late Gothic building on the south side of Freiburg's Münsterplatz. Built between 1520 and 1530, it was once the center of the financial life of the region. 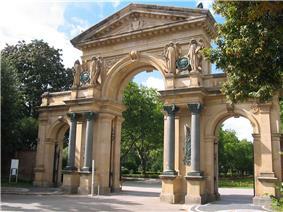 Its façade is decorated with statues and the coat of arms of four Habsburg emperors. The Altes Rathaus, or old city hall, was completed in 1559 and has a painted façade. The Platz der alten Synagoge "Old Synagogue Square" is one of the more important squares on the outskirts of the historic old city. The square was the location of a synagogue until it was destroyed on Kristallnacht in 1938. Zum Roten Bären, the oldest hotel in Germany, is located along Oberlinden near the Swabian Gate. The Siegesdenkmal, or victory monument, is a momument to the German victory in the Franco-Prussian War in 1871. 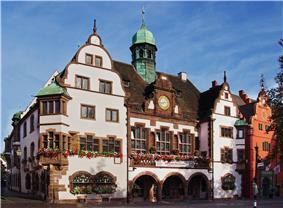 It is situated at the northern edge of the historic city center of Freiburg. The Siegesdenkmal was built by Karl Friedrich Moest. 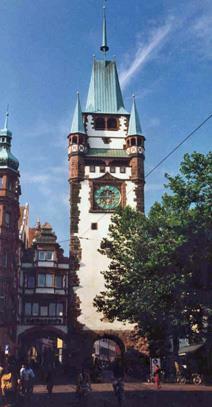 In everyday language of people living in Freiburg, it serves as an orientation marker or as a metting place. 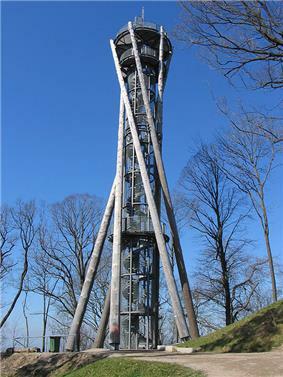 To the east of the city centre, the Schlossberg hill provides extensive views over the city and surrounding region. The castle (Schloss) from which the hill takes its name was demolished in the 1740s, and only ruins remain. Schlossberg retained its importance to the city, however, and 150 years ago the city leaders opened up walks and views to make the mountain available to the public. Today, the Schlossbergbahn funicular railway connects the city centre to the hill. 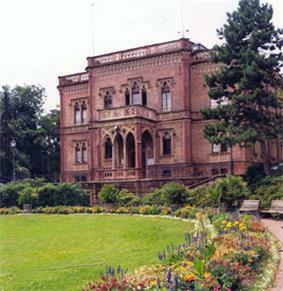 Other museums in the city include the Archaeology Colombischlössle Museum. In 2010, Freiburg was voted as the Academy of Urbanism's European City of the Year in recognition of the exemplary sustainable urbanism it has implemented over the past several decades. 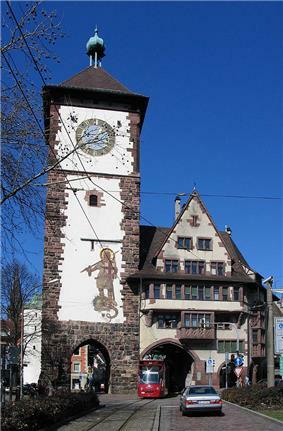 Freiburg is bordered by the Black Forest mountains Rosskopf and Bromberg to the east, Schönberg and Tuniberg to the south, with the Kaiserstuhl hill region to the west. Köppen climate classification classifies its climate as oceanic (Cfb). 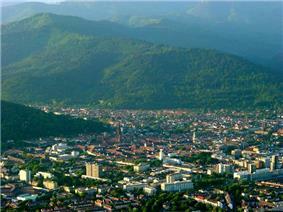 Freiburg is known as an "eco-city". It has attracted the Bundesamt für Strahlenschutz, solar industries, and research; the Greens have a stronghold there (the strongest in any major German city; up to 35% of the overall city vote, in some neighbourhoods reaching 40% or more in the 2012 national elections). The newly built neighbourhoods of Vauban and Rieselfeld were developed and built according to the idea of sustainability. The citizens of Freiburg are known in Germany for their love of cycling and recycling. 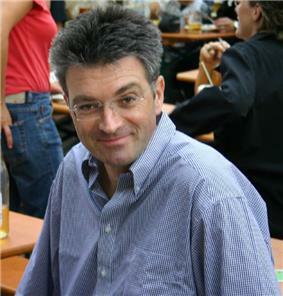 The Oberbürgermeister, Dieter Salomon, (elected as of 2002), was the first member of Bündnis 90/Die Grünen to hold such an office in a city with more than 100,000 inhabitants. In June 1995, the Freiburg city council adopted a resolution that it would permit construction only of "low-energy buildings" on municipal land, and all new buildings must comply with certain "low energy" specifications. Low-energy housing uses solar power passively as well as actively. In addition to solar panels and collectors on the roof, providing electricity and hot water, many passive features use the sun’s energy to regulate the temperature of the rooms. 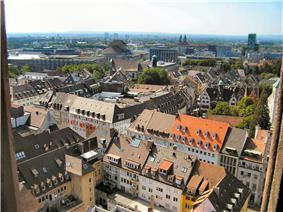 Freiburg is host to a number of ICLEI - Local Governments for Sustainability, ISES - International Solar Energy Society, and the City Mayors Foundation. The city houses one of the oldest and most renowned of German universities, the Albert Ludwig University of Freiburg, as well as its medical center. Home to some of the greatest minds of the West, including such eminent figures as Johann Eck, Max Weber, Edmund Husserl, Martin Heidegger, and Friedrich Hayek, it is one of Europe's top research and teaching institutions. 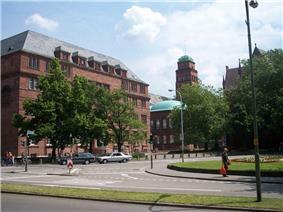 Freiburg also plays host to various other educational and research institutes, such as the Freiburg University of Education, the Protestant University for Applied Sciences Freiburg, Freiburg Music Academy, the Catholic University of Applied Sciences Freiburg, the International University of Cooperative Education IUCE, three Max Planck institutes, and five Fraunhofer institutes. The city is home to the IES Abroad European Union program, which allows students to study the development and activities of the EU. 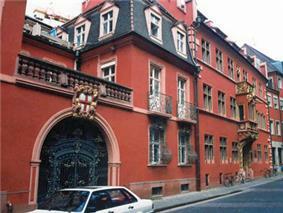 The DFG / LFA Freiburg, a French-German high school established by the 1963 Élysée Treaty, is in the city. 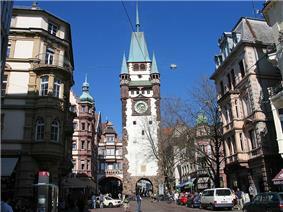 Freiburg has an extensive pedestrian zone in the city centre where no motor cars are allowed. 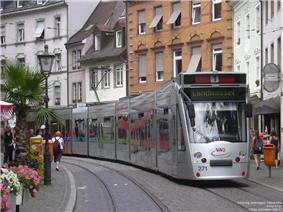 Freiburg also has an excellent public transport system, operated by the city-owned VAG Freiburg. The backbone of the system is the Freiburg tramway network, supplemented by feeder buses. 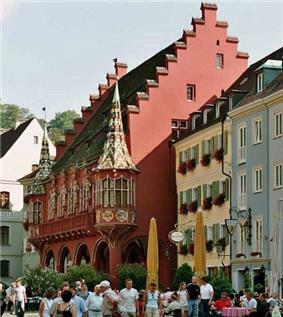 Freiburg is on the main Frankfurt am Main - Basel railway line, with frequent and fast long-distance passenger services from the Freiburg Hauptbahnhof to major German and other European cities. Other railway lines run east into the Black Forest and west to Breisach. The line to Breisach is the remaining stub of the Freiburg–Colmar international railway, severed in 1945 when the railway bridge over the Rhine at Breisach was destroyed, and was never replaced. The city also is served by the A5 Frankfurt am Main - Basel motorway. Freiburg is served by EuroAirport Basel-Mulhouse-Freiburg in France, close to the borders of both Germany and Switzerland, 70 km (43 mi) south of Freiburg. Karlsruhe/Baden-Baden airport (Baden Airpark) is approximately 100 km (62 mi) north of Freiburg and is also served by several airlines. Other nearby airports include Stuttgart, Munich, and Frankfurt Hahn. Flugplatz Freiburg, a small airfield in the Messe, Freiburg district, lacks commercial service but is used for private aviation. Car share website such as Mitfahrgelegenheit are commonly used among Freiburg residents since it is considered relatively safe. 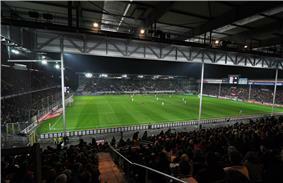 Freiburg is home to football team SC Freiburg, which plays at the Dreisamstadion. Freiburg also has the EHC Freiburg Ice hockey team, which plays at the Franz-Siegel Halle, and the RC Freiburg Rugby union team, which competes in the Regionalliga Baden Wurttemberg. Iranian president Mahmoud Ahmadinejad's controversial comments, which included questioning the dimension of the Holocaust, have sparked discussions concerning Freiburg's relationship with Isfahan. Immediately following the comments, Freiburg's mayor Salomon postponed a trip to Isfahan, but most people involved, especially those in the Alliance '90/The Greens party, were opposed to cancelling the relationship. The city's England, which has the same patron. 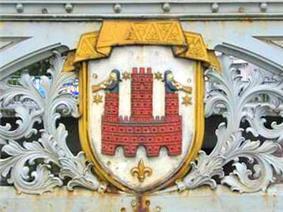 The city also has a seal that can be seen in a few places in the inner city. It is a stylized depiction of the façade of the Wasserschlössle, a castle-like waterworks facility built into a hill that overlooks the residential district of Wiehre. The seal depicts a three-towered red castle on a white background, with green-clad trumpeters atop the two outer towers. Beneath the castle is a gold fleur-de-lis. Hermann Staudinger, Nobel Prize laureate in chemistry "for his discoveries in the field of macromolecular chemistry"
Otto Heinrich Warburg, 1931 recipient of Nobel Prize in Physiology or Medicine; awarded Iron Cross 1st class (1918). ^ "Gemeinden in Deutschland mit Bevölkerung am 31. Dezember 2013 (Einwohnerzahlen auf Grundlage des Zensus 2011)". ^ Website for the German Agricultural Society: Baden (accessed on January 1, 2008). ^ a b c "Stadt Freiburg im Breisgau: History". www.freiburg.de (Stadt Freiburg im Breisgau). Retrieved 2009-04-11. , also Arnold, Benjamin German Knighthood1050-1300 (Oxford: Clarendon Press, 1985) p. 123. ^ Spector, Shmuel and Wigoder, Geoffrey, The Encyclopedia of Jewish life Before and During the Holocaust, New York University Press 2001. See Die Synagoge in Freiburg im Breisgau. ^ "Erlebniswelt Schlossberg" [Experience Schlossberg] (in German). Stadt Freiburg. Retrieved 2011-02-13. ^ "Freiburg/Breisgau historic weather averages" (in Deutsch). weatheronline.de. Retrieved 22 June 2014. ^ a b Is this the greenest city in the world? 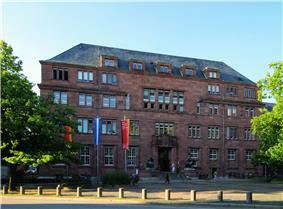 ^ "Lawyer Freiburg". Retrieved 28 November 2014. Käflein, Achim (photographs); Huber, Alexander (German text) (2008). Trefzer-Käflein, Annette, ed. Freiburg. Freund, BethAnne (English translation). Freiburg: edition-kaeflein.de.